Caillou Kindergarten: Counting and Thinking Skills Combined Game Review - Download and Play Free Version! Offered in three languages, helping your child build both native and foreign languages. Over 50 games plus 12 coloring pages that will keep your child busy. Subjects improve counting, critical thinking, coloring and creativity. Educational game that improves verbal and visual skills. Most of the games are similar and only vary slightly. Play Educational Games with Caillou! Caillou Kindergarten is a great way to get children ready for kindergarten and to help them practice what they're learning in kindergarten! Children will have a blast playing with Caillou and his toys while learning about counting and organization. Caillou will teach children vital skills like number recognition, sorting, same and different, associations and more in 26 exciting activities. Children can even learn Spanish and French! Some exciting activities include clicking on all squares that have a certain number to move Caillou through a maze, finding all the items in Caillou's room that don't belong, finding the opposites of objects, catching letters to spell words, matching pictures, coloring and more. Playing with Caillou is a fun and memorable way for children to build a strong foundation in counting and thinking skills that will serve them for the rest of their lives. The ability to play the game in three languages is a fun addition that will keep children interested for countless hours. The whole family can play and enjoy time together! Give your children a game that's entertaining as well as educational with Caillou Kindergarten! Caillou's Kindergarten might be the perfect game for your young child who is developing both his or her verbal and cognitive skills. This game which is divided into three parts is a learning game that truly seems to care about improving the mind of your child. 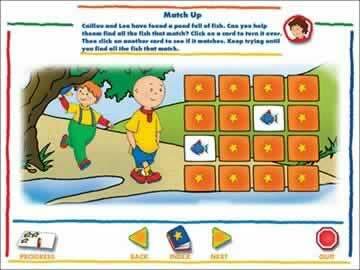 In this game your child helps Caillou solve both matching and number recognition games. Caillou's Kindergarten is highly focused on learning, yet presents the material in a fun manner. It's simply perfect for your developing child. As the game opens you are given a choice as to which language you'd like to play. This is a great feature and the first of many features that show this game is designed to be educational. Having a choice on which language to play is great for a couple of reasons. First, the multiple options makes this game playable by a larger crowd, making it's meaningful message more accessible and applicable. Also, three choices makes it possible for young kids, who are knowledge seeking individuals, to learn new languages. Young children are like sponges and teaching them multiple languages at a young age is highly beneficial because they have a knack for absorbing information. Once your language is determined you are faced with another option of which subject you want to play. This game focuses on getting your child prepared for kindergarten by playing counting games, critical thinking games, and through coloring and creativity. In Caillou's Counting your child has the choice of 25 games to play. These games vary slightly in objective, but have a constant theme of learning, especially counting. In the games you might need to identify numbers from a cluster, find all the fives to clear a maze, or finish sequences of numbers by correctly filling in the blank. The games are great for learning numbers and number recognition. The second game your child will get to play is Caillou's Thinking Skills game. In this mode your child is again presented with a variety of game, 25 in total, that help with critical reasoning. The games, like in the counting mode, vary in objectives, however, they all remain challenging with a critical reasoning theme. You might have to play memory match games with 16 tiles, or you can play games that make your child logically place pieces that go together. This could be rebuilding toys that are in parts or matching items that are related to each other. In one match game you pair things that go together. Like milk and a refrigerator or shoe laces and shoes. The games are similar to those in the counting category, but are logic related. The third and final mode of play is a coloring book. This helps build your child's creativity. In this simple game mode you can “color” (filling the picture with color through mouse clicking) 12 different pictures. Some of the pictures are of Caillou, while others are toys or fish. The coloring is simple, but it is a great addition to developing the creativity of your child. The upside of this game is incredible. It is well designed and presented in an educational and fun manner. The only flaw of the game might be that it's too repetitive. The objectives vary little if at all. Instead of matching pictures like in the logic game, you might match numbers in counting category. Though kindergarten aged players might not find these to be a problem, the repetitive nature could get old. Caillou's Kindergarten is a fantastic educational game designed for your kindergarten bound child. The skills he or she will pick up are important for building a strong educational foundation. Also, the ability to play in different languages makes this game a great second language tool as well. Give this a try and you and your child won't be sorry. This game is a great aid that teaches so many valuable skills in a positive manner.